As humans, we are indebted to this planet. From the air we breathe to the food we eat and the clothes we wear – our very existence is due to our planet. But that does not stop us from destroying it for our gains. But the Sikh community, along with other environmental groups, is trying to bring about a change to commemorate the 550th birthday of Guru Nanak, the founder of Sikhism. The project which is aimed at making our planet just a little bit greener is called the Million Tree Project, which is headed by the organization EcoSikh, which is based in Washington DC. Rajwant Singh, who is the president of the organization claimed that Guru Nanak was a lover of nature. The Guru talked about the environment as an expression of the heavenly creator. Many of the writings of the Guru also spoke about how one can learn about life lessons from nature itself. It is also noteworthy that there’s a line in one of the several hymns that Sikhs chant in their daily prayers, “Air is the teacher, water is the father, the earth is the mother.” It substantiates the Eco-Sensitive narrative. The project aims to plant native flora in several zones around cities. The long term aim of the project is to encourage the more environmentally conscious younger generation to develop sustainable practices. In addition to that, the community intends to do this so that the next generation can reap the benefits of what this generation sows and continue the practice onwards. As per Media Roots, about 500,000 to 700,000 people of the Sikh community call the United States their home. But in spite of this healthy number of individuals in the community, the Sikhs do not get any media coverage. This might be because Sikhism does not lean on violence and is largely recognized as a peace-loving and inclusive religion. Most Sikhs live in India, in the state of Punjab. Here, the community intends to plant about 550 tree saplings in each village. But the project is obviously not limited to the Sikh community. They welcome everyone to help out in achieving this goal. This inclusive attitude has helped the project to supply 100,000 children in Ghana with one sapling each for planting. The project has also inspired other similar projects such as 1m Trees Borneo. The Million Trees project certainly shows how humans can come together and truly do something beneficial for the whole planet. The project has almost two thousand of these plantations planned across the planet. The project leaders hope that the millionth tree would be planted by November, just in time for Guru Nanak’s birth anniversary. 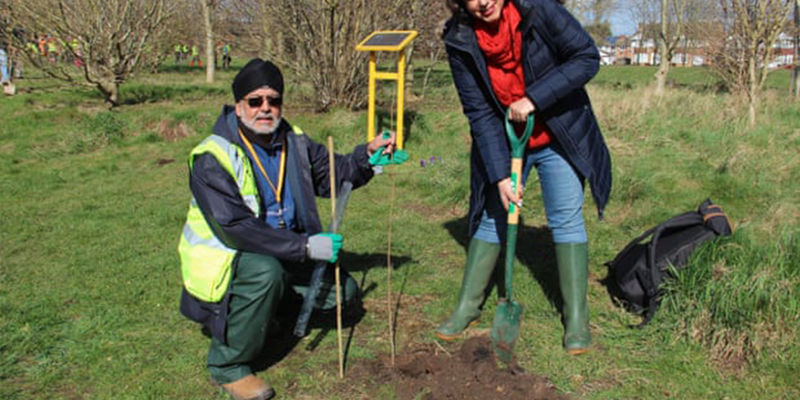 Sikh Union Coventry has already started planting flowers and shrubs at Longford Park. Are you willing to help out?
? Men With Beards Carry More Germs Than Dogs According To This Study Billion Dollars Has Been Raised For Notre Dame Cathedral But We Can’t Fix The Planet ?